FlamesRising.com is pleased to present an interview with James Semple, a composer and musician who hails from the UK. 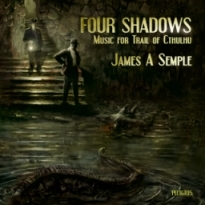 Semple’s work includes compositions for Pelgrane Press, a storytelling games publisher whose award-winning titles include TRAIL OF CTHULHU and MUTANT CITY BLUES. In this round of questions, we ask Semple to confirm the rumor that he recently was named as composer for the upcoming HOUSE OF HELL movie and more! Although music has always been a part of my life, I knew I wanted to be a musician after watching Star Wars for the first time back in 1977. I remember how the power of that huge orchestral music really moved me; that moment has stuck with me, even to this day. Of course, as I became a teenager I got into rock bands like Aerosmith and Queen, and I began playing electric guitar. The more I got into rock music, the deeper I focused on a technical style, improvising difficult lead solos. This meant I ended up not writing much music for a while. Admittedly, I loved performing live because I was always more comfortable up on stage than in the studio, but eventually I relented and began creating my own home studio. At that point, I noticed that the studio technology had advanced so far that I could actually write orchestral stuff just using virtual instruments. This technology gave me the opportunity to write what I originally wanted to write way back when I was a kid. These days I actually play more piano than guitar. Can you describe the first song you ever wrote? While I can’t remember my first song, there’s a good chance that it might have sounded a lot like Marillion with lots of picked broken chords and chorus/delay effects. Back then, I was writing a lot of stuff like that in D minor, which we all know is the saddest of all keys. Then I did the whole angst-ridden, romantic stuff when I was backpacking around Australia with an acoustic guitar (like about a million other English guys who can’t surf but still want to impress girls). How has your process for composing music changed since that first composition? When I started composing music, I was the typical guitarist in a band who didn’t really know what the other guys did. I’d just write chord changes and riffs and let everyone else figure out their parts. These days I mostly write orchestral music and go into great detail arranging parts. There’s a lot of differences between improvising to create a rock song and crafting orchestral arrangements. One thing that hasn’t changed much since my days in a rock band is how I get my initial inspiration. Normally I hum or sing ideas to myself. Then I go for a walk and just come up with melodic fragments that I then use to seed ideas. This initial process can take a while and I often let the melodies ‘marinate’ in my subconscious until they feel developed. Then I sit down at a piano or guitar and I play with them, write them out on the music stave and develop the melody further by adding harmonisations or accompaniment ideas. I’ll often work on three or four variations of the theme right then so that I have ideas of where to take it. I also like to pick a ‘pallet’ early on during a project. Selecting the main instruments to be used is always important to me and influences my further writing. I’m about to begin scoring an offbeat UK comedy called Kenneth (http://www.kennethmovie.com) and we’re picking a particularly unusual set of instruments for that. During a project I’m usually surrounded by many scraps of paper and music manuscript with all of my various harmonic devices, accompaniments and motifs. Once the themes are created, I reuse them in different combinations to create interesting sounds. I find that the strong the theme, the easier it is for me to compose an arrangement. Do you prefer composing music for horror versus other genres? Good question. Horror is an exceptionally interesting genre of music. In some ways, it is a defined and narrow musical genre but in other ways there is a lot of freedom to play with different sounds and instruments. For instance, you’ll typically hear minor keys used in harmonies with influences of diminished harmonies or the occasional scales from central and Eastern Europe. On the other hand, you’ll often hear a lot of avant garde techniques from the instruments which are seldom heard in other genres of music. I can’t say I prefer one genre over another because I always tend to love what I’m doing at that point in time. Right now, I’m working on a lot of horror arrangements so it’s currently my favourite. I love the chance to make a huge impact with the music and to really set the tone of a scene. Music plays an enormous part in scaring the audience during a horror film and it’s a great feeling when I can create music that does precisely that. Can you give us a sneak preview of an upcoming work? This a piece of music I wrote for the Eternal Lies campaign for Trail of Cthulhu RPG from Pelgrane Press. The campaign is going to feature over an hour of commissioned music specifically written and tailored for the individual scenes. This particular piece has a sentimental, melancholy theme that’s featured in an important scene early into the story. You can hear that one of the main themes is quite clearly presented here on both piano and strings. This is probably one of the ‘nicest’ cues in the suite. The other music tends to be far more unsettling than this. Rumor has it you’ve been hired as one of the composers for the film HOUSE OF HELL. How did you get that job? Haha! Well, the rumours appear to be true. I guess it’s on IMDb now so I can talk about it. I was already a fan of Fighting Fantasy and I discovered the movie through the Fighting Fantasy website. I got in touch, sent them a showreel and went in to meet the group. We got on really well and I was able to share with them that I was a fan of the source material and had a background in horror, which helped keep me in the selection process. Given my background in RPG-related music, I believe that composing for HOUSE OF HELL is a wonderful natural progression for my career as a professional composer. Ian, the director, really knows what he wants and I think he’s going to do an amazing job on this. The other composers are great guys as well and this is going to be an incredible experience overall. How does composing music for games differ from your other works? In film, I score to an exact scene so that the music is timed to the events on camera. With games, I often have to write looped tracks for ambient or action music that can be played continuously. This is the same for both RPG-related and video game music of course. I’ve really enjoyed writing for games and you can hear some of my music on version 1.5 of The Witcher video game. I’ve really been surprised by the dedicated following there is for pen and paper RPG music. It’s great to see comments about how players enjoy it. You had composed a short piece for THE QUEEN OF CROWS e-book trailer. Can you tell us about your experience? That particular piece was a lot of fun. It was done at a pretty breakneck speed and there was a lot of back and forth with the editor. She really had a strong idea of what she wanted and it was great fun integrating music with the sound effects of crows and fire and explosions. Definitely new ground for me with the Native American angle and it’s always cool to do new things. Really pleased with how it all came out and Monica was a joy to work with. Editor’s Note: We’d like to mention that you can listen to Semple’s work by viewing THE QUEEN OF CROWS trailer on YouTube! Can you tell us the story about how you met the folks at Pelgrane Press? In FOUR SHADOWS, you composed different types of Cthulhu-inspired music. Which one is your favorite and why? I was really pleased with the way Four Shadows turned out overall. We had a strong concept for that music. Horror often uses a lot of ‘sound design’ so I thought about how a 1930s orchestra and what kind of sound design they might have performed live on stage. For this collection, I used wind machines and chimes which would have all been available at the time. I also took a lot of ideas from jazz because of the pulp theme for the game. For example, American orchestras of the time were experimenting with sound effects like car horns and I thought this seemed very appropriate for 1930s music. How did your work composing music for ESOTERRORISTS differ from what you did for TRAIL OF CTHULHU? 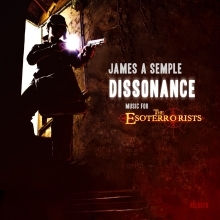 The Esoterrorists music compositions gave me more of a free rein than the work I did for Trail of Cthulhu. Cthulhu already tends to have a sound associated with it and I felt I couldn’t veer too far from that. Not only is there an era-specific sound, but there’s a lot of Bartok in there as well. With Esoterrorists, I had the opportunity to create an entirely new musical identity that was a lot more modern with drum loops and electric guitars. I went quite musique concrete with the track ‘Membrane’ using a lot of different sound design ideas. I have to say that I loved writing for this and would love to score an entire film or TV series of this kind of music. Basically Esoterrorists was either quirky, oddball stuff or really heavy drums and guitars so it was huge fun end-to-end. You mentioned recently on Twitter that 2010 is definitely your year. How have your recent musical engagements changed your life? Working as a composer has allowed to meet a lot of exceptionally cool people I wouldn’t have met otherwise. With the recent announcements, I can move into scoring music full time which is a dream come true. I’ve also made a really strong effort to keep up with everyone who has helped me or given me opportunities. My friends are incredibly important to me and I’m getting a chance to work with a lot of them. Of course 2011 is now looking like it might be even better so I have to be careful with what I might let slip here. Who knows, maybe next year I might even get to go to GenCon finally!